”If someone was breathing close to the logger, the temperature would rise at 16:30, but humidity also. If a heat source was involved (local heater, lamp,..) I would expect rising temperatures, and lower humidity, but no that drastically. Chris Au: ”My first avenue of inquiry would be to confirm the integrity of the datalogger; was the data compromised in its collection, interpretation, storage or transmission? Secondly, was there any other evidence of the T and RH fluctuation? Thirdly, what are the items in storage? Could anything there be a cause? ”I was going to comment that the places where temperature and relative humidity go up or down together (at least briefly) looks like the objects controlling the conditions. We’ve seen this in a historic house in which the attic went up and down in temperature with day and night. In the day, temperature would rise accompanied sometimes by a small dip in RH followed by a sharp rise in RH before plunging. As temperature peaked and started dropping, we might see a little upward spike in RH but followed by a sharp drop in RH as temperature fell before rising back up. 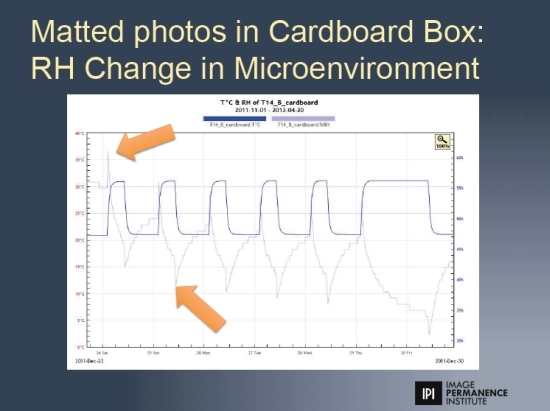 This was the wood in the attic releasing water vapor as temperature went up (off-setting the expected drop in RH as temperature rose) and the adsorption of water back into the wood as the temperature fell again. We more recently ran into in a warehouse full of ceramic pottery pieces from archaeological digs. The clay was also adsorbing water as temperature went down and releasing as the pottery pieces warmed up. Keep watching your climate data, folks! This post is also available in Russian translated by Helena Tomashevskaya. I accepted a request from members of the Island Church Foundation to serve as s Board Member and as an advisor to the Board. The Board is commited to establishing a climate controlled display space, including a work area and storage area in a building separate from Saint Wenceslaus Church. The Board Also committed itself to search for students, who will be considered as equal to adults volunteers. This is a huge committment from the Island Church Foundation for insuring the future if its heritage. The Bosrd is also working with the University of Wisconsin-Milwaukee in creating an Intern position with a stipend to assust with the cataloging the current collections of the Foundation. This is an exciting time to work for the future of the Foundstion. so glad to hear your institution is moving forward in collections care. This is a huge achievement. Congratulations!